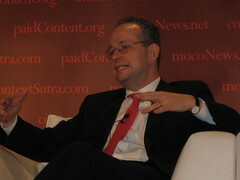 With the buyout of Dow Jones (NYSE: NWS) nearing completion, Wall Street Journal publisher Gordon Crovitz chatted with paidContent.org executive editor Staci Kramer, at the Future of Business Media conference. Discussion centered on the topics of the day: the merger, making the Journal free, the role of subscription revenue. — Wall Street Journal: There are 983,000 subscribers online, but there are 10 million visitors to the site… millions more if you count MarketWatch and Barron’s Online. Online Journal is playing a very significant role in extending the brand. Not as well known: how the Online Journal extends the print part of the brand specifically. Print circulation has grown now for 7 straight quarters. The role of the print journal is to put all of the information — which readers already know form the day before — into context and perspective. Various properties (MarketWatch, WSJ Blogs, Dow Jones Newswires) produce information in real time. The Journal itself is then able to digest it. — Marketwatch Acquisition: Acquisition is exceeding expectations. “It’s hard to imagine what the information world was like in 1997, when MarketWatch was started.” “Ten years later, the information that’s available at Markewatch, the tools available at MarketWatch, are superior to what professionals had 10 years ago”. The site has taught a lot to the rest of Dow Jones about multimedia. — Verticals: “The big opportunity for us is how do we use the new medium of online and other digital products to serve deeper audiences”. 18 months ago the Journal launched its first industry blog for lawyers. Just the blog itself has built up a significant community. “Big opportunity for brands like the Journal to address specialized markets”. News Corp. acquisition will provide the capital needed to invest in these. — WSJ vs. Yahoo (NSDQ: YHOO) vs. Google: ” We consider ourselves good partners for Yahoo, Google (NSDQ: GOOG), MSN, AOL.” Strategy is to work with others to drive traffic back and forth. The challenge is to justify the maintenance of a larger editorial staff when other financial destinations don’t have that as part of their model. Company is open to different models, working with third party ad networks. There are ways to collaborate with Google et. al.